biggest difference with all other South American countries were the outrageous entrance fees Peru charges foreigners for some of its historical and cultural sites. Nov ’14: the rate was 3.7 soles to a euro. Cusco: PCB and other banks had the necessary logo stickers on the machines, but nevertheless didn’t work with our debit card. The only bank we could withdraw money from was the Scotia Bank. At times it was tough to break larger bills. 50 soles (18 US dollars) is considered a large bill. So, wherever possible (e.g. gas stations), we paid with 50 or 100 soles and hoarded smaller bills but especially coins for when demanded. Peruvians demand undamaged bills. They can be extremely picky about it. Initially we weren’t aware of the issue and accepted the change as we received it. Subsequently nobody wanted our 10 soles bill with a minor tear. Oh, the nuisance. We visited a bank in Cusco and could exchange it for a new bill. No sweat. But, here comes the tricky part: apparently, there are a lot of counterfeit bills in circulation. Especially, but not limited to, 100 soles bills may be false. How do you know? No idea. One guy kept on checking our bill, to which Coen responded it came straight from an ATM – it was even a new bill. “It doesn’t matter, you can get fake bills from the machine as well,” he responded. But ours seemed to be okay. Phew. At one point my 5 soles coin was refused because the woman said it was false. I just put it back in my wallet and paid with it elsewhere. 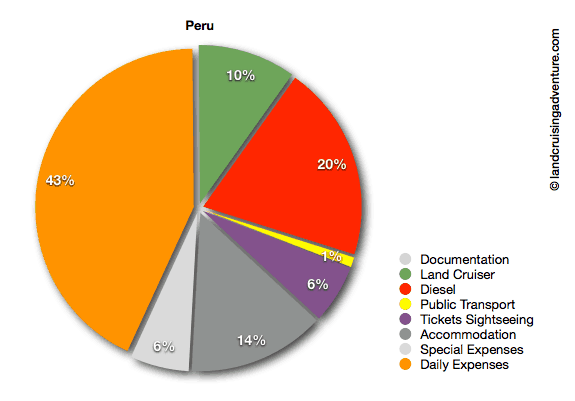 Time spent in Peru: 292 days (2013/2014). Average distance covered: 35 kms/day. Not included in expenditures: insurances, electronic equipment, medical expenses. three-month visa and exited from Peru to Chile after which we returned for an additional three months. You don’ need a Carnet de Passage for Peru. 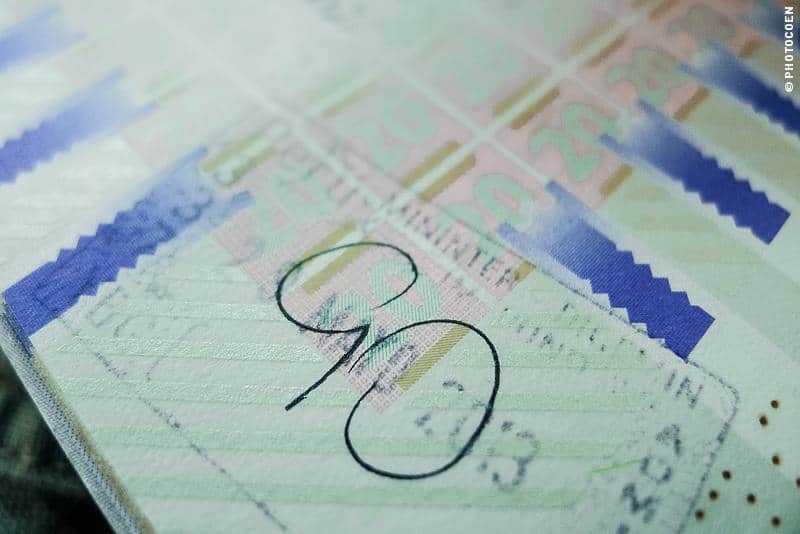 At the border you are issued with a Temporary Import Document (TID) for your vehicle, which is valid for three months. Officially, you can’t extend it, but we’ve heard there are ways. Ask around in the overland community, for example here. 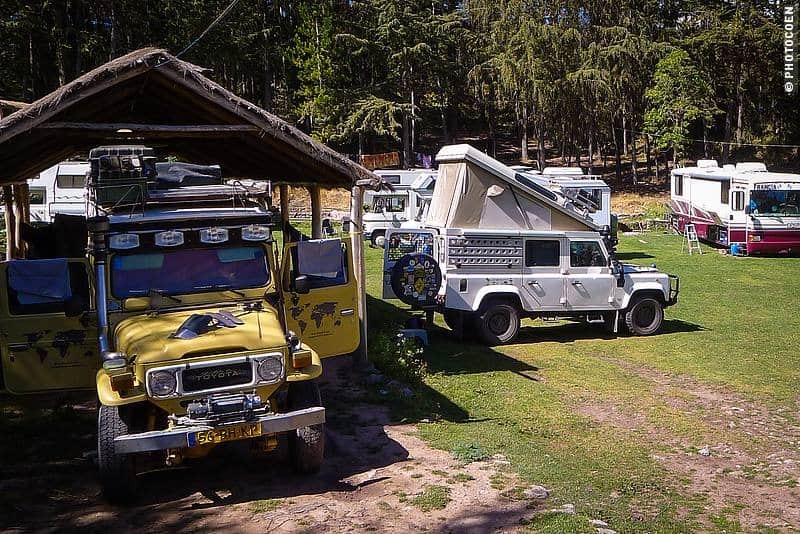 Having said that, we do know of travelers who could make arrangements with the Aduana to leave their vehicle in the campsite of Quinta Lala (Cusco) for a longer period of time. Check with Milagros (caretaker of the campsite) if this procedure still works and if so, what steps are required. 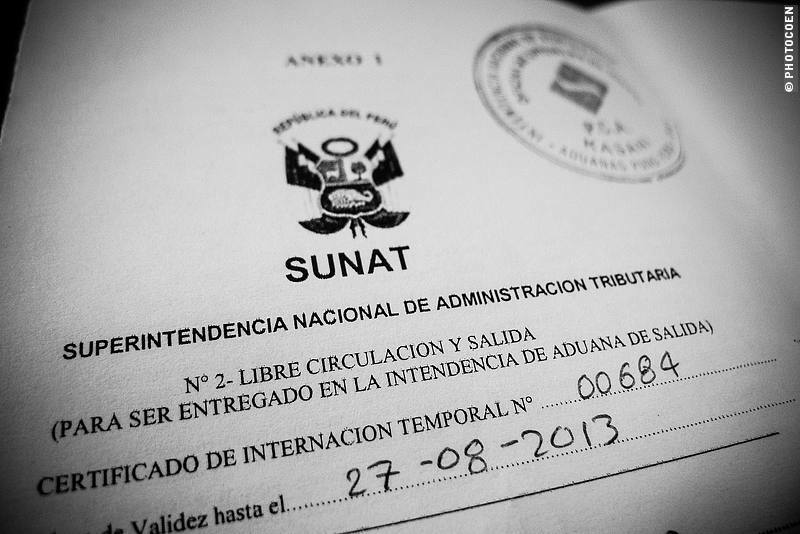 Also check Earthcircuit’s excellent write-up on their paperwork done in Lima. Of course, every situation may be different. Which is what we encountered when trying to apply their guidelines in Huanchaco to get our Land Cruiser suspended for our yearly break to organize the Overland Reunion in the Netherlands. Global outlines are the same, you just have to see how things ‘flow’ at the place where you are. I still have to do a write-up about this ‘struggle’ (it worked, it just took quite a few days). Another good information point is at the WikiOverland. In a way Peru has been awkward because we had numerous flat tires. For a car that had about 5 flat tires over the past 10 years, that is unusual indeed. Some of them happened on the flattest asphalt and were puzzling. After the first couple of them, Coen concluded it was a problem of the inner tubes, after all they had been in the tires since India (about 8 yrs ago), so they were simply gone. But even after we replaced them, we continued to have a couple of flat tires, most often on the right front. The puzzle as to why hasn’t been solved yet. So that’s where part of the expenditures for the Land Cruiser went: fixing tires and buying a couple of new inner tubes (costing about 6.5 euros a piece). The household batteries were gone as well and we replaced them without a problem in Lima (some 165 euros for 2 batteries, including 4 terminals). 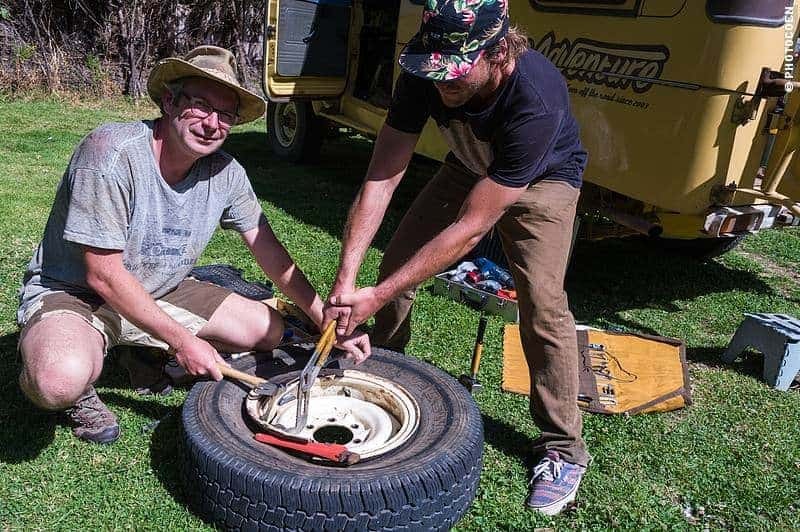 Other issues included simple ones like welding the exhaust after it broke on a rough road and buying a new fire extinguisher after we emptied ours when helping out on a fire at Quinta Lala Campsite in Cusco. One day, in Chavin de Huntar, the glow system suddenly stopped working. Coen though the Pre Heating Timer had eventually died. He worked a day to install the infamous ‘wilson-switch’, only to discover that it still wasn’t working. More investigation learned that strangely enough all four barely used OME glowplugs had died. We had a rough start because of the cold and altitude and drove to Huaraz to find four aftermarket glow plugs for 25 euros (eventually they were sent from Lima, which took one day). More challenging were fixing the tie rods and other work in the front part of the car. Good asphalt is quite common. Sheep go on the roof. 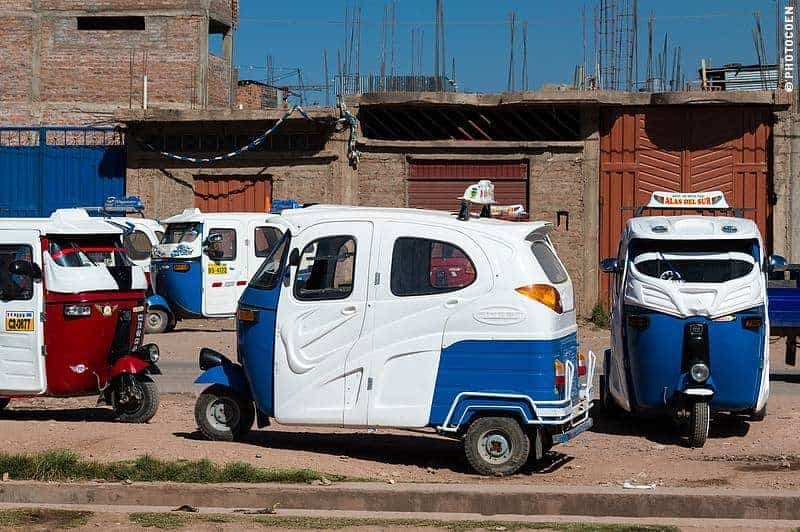 We still call them rickshaws (like in India) but here they are called tri-cyclos. 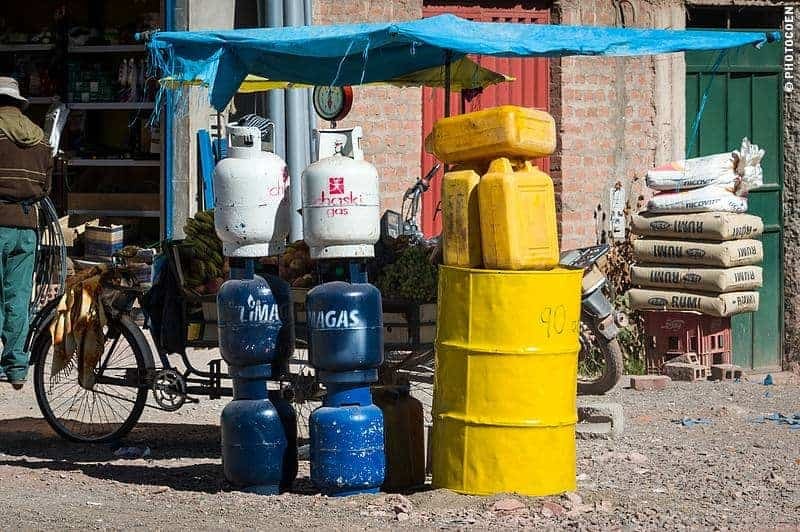 Start saving: Peru is a huge country and diesel costs about 1 euro per liter (varying roughly between 13.3 and 15.5 soles per gallon). Diesel costs add up in this country and it definitely was part of the fact that we didn’t travel it as extensively as we usually tend to do. Bring your calculator (non-Americans, that is). 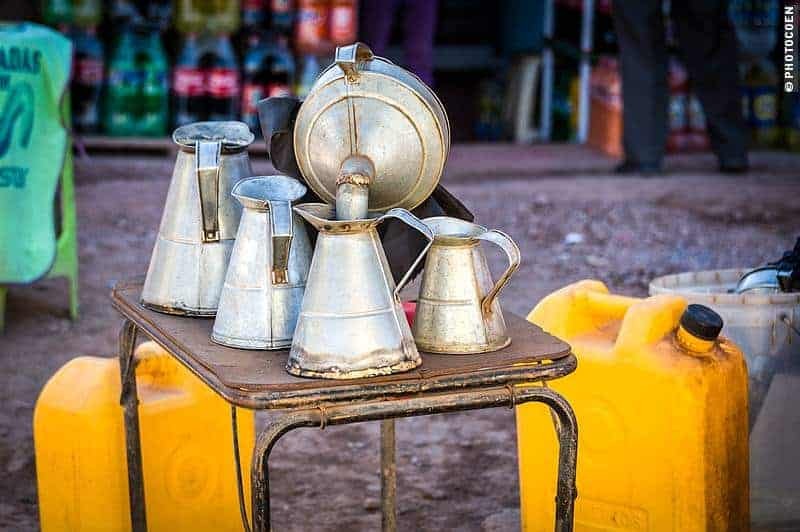 Peru uses gallons and there are 3.76 liters to the gallon. Don’t worry, in most places you’ll find common gas stations. Our Land Cruiser drives well on all Peruvian diesel. We heard stories about diesel being diluted with water (cheaper gas stations in particular) but we can’t confirm this. The Land Cruiser has a steady mileage. We had no problem finding gas stations, and with one or two exceptions they all had diesel. 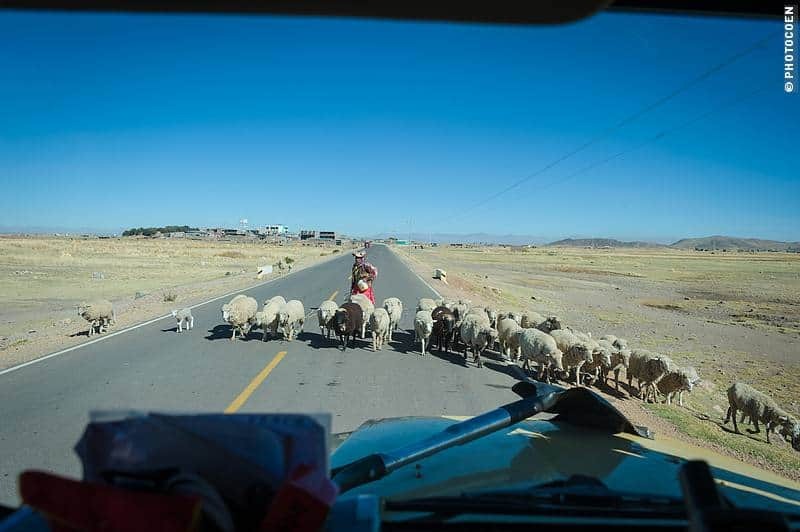 In Peru, the roads vary from excellent asphalt to tough (potholed and washboarded) dirt roads. We find the Pan-Am by far and large the most boring road in Peru (well, in most of South America, really). It is an well maintained road, but mostly crosses desert, which may be inspiring and new for the first hour crossing it, but then becomes pretty much monotonous. 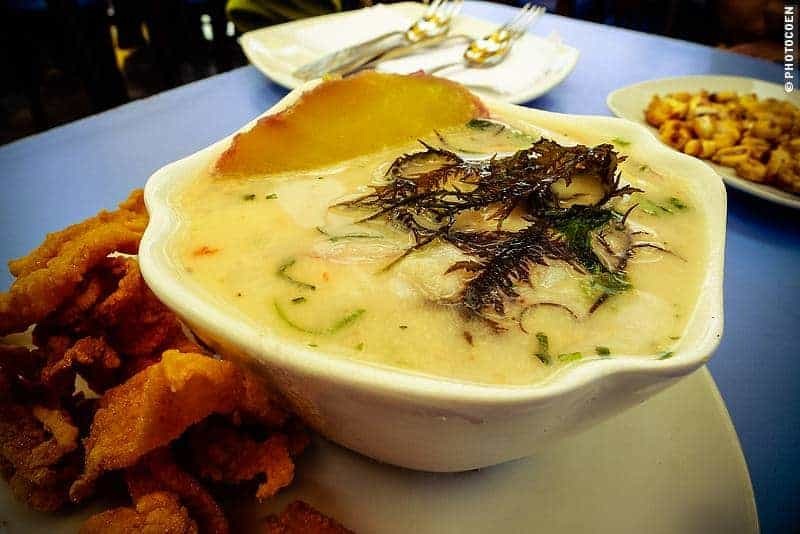 If you want to see Peru, and a variety of landscapes, drive away from the Pan-Am and take the minor roads, whether this is right along the coast or inland. The Cordillera Blanca is just fabulous to explore. 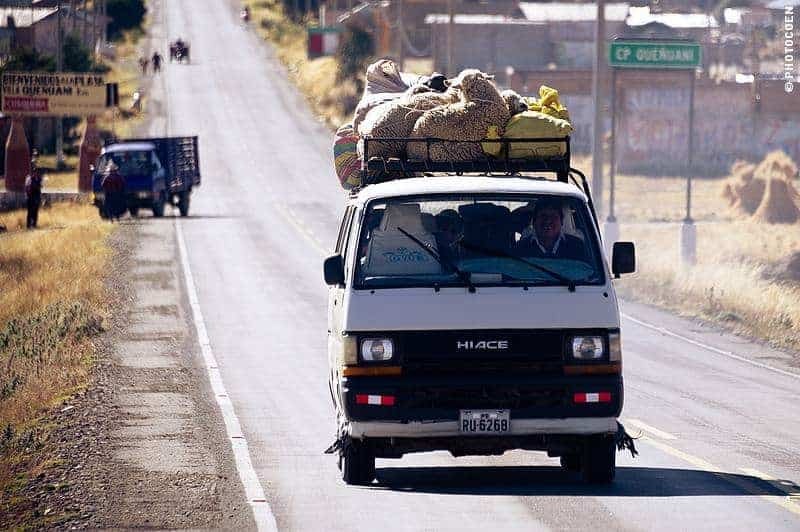 You pay once or twice if I remember correctly between Lake Titicaca and Cusco. There are toll roads on the Pan-Am. We came across many police checkpoints, more than anywhere else in South America, and had no problem what so ever. Often we were waved on as soon as they saw the foreign license plate, or they were just curious about our car and wanted a chat. As long as you use your seatbelt, have your lights on during the day, and your paperwork in order, there is nothing to worry about. Peru is asphalting all over the place, which brings me to the issue of road maintenance. In some cases you can drive along the roadwork but in most cases you can’t (especially in the mountains where they often have to dynamite to clear the road from landslides). Don’t be surprised having to wait from 7 to 12am and 1 to 6pm. 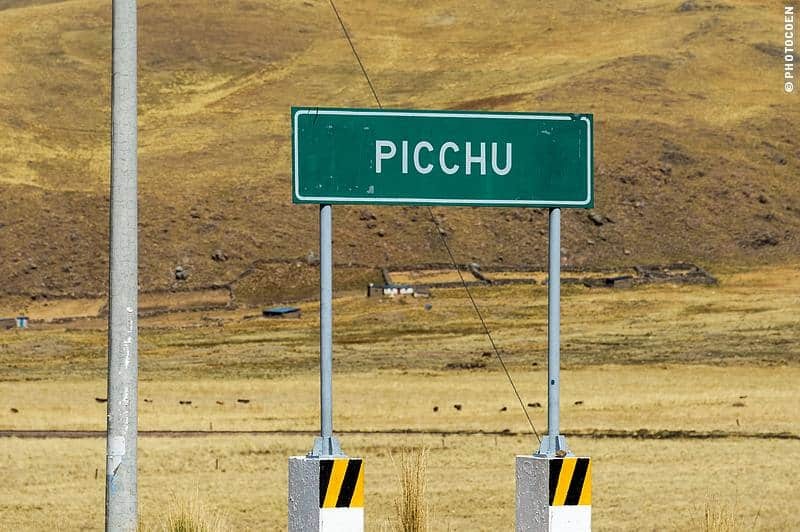 A notorious one in this respect is the road between Paucartambo (north of Pisaq) and Manu National Park. This narrow dirt road is stunning to drive but forever under maintenance due to landslides. Expect 2 days to drive up/down. As usual we stuck to our Reise Knowhow Map, which is among our favorite brands of roadmaps. Our Peruvian map was a bit dated so not that accurate, but good enough. We’ve also had good experiences with Nelles Verlag Maps and International Travel Maps. Our standard guidebook is Lonely Planet. Although quality can differ quite a bit per country and edition, we generally find it gives a good overview of the country. We use this book to get a feel for the country and once we’ve crossed the border we will search for local guidebooks and other sources of information. E.g. you will find some professional tourist information centers in Peru, especially in the tourist areas/cities, which you will recognize by this logo. 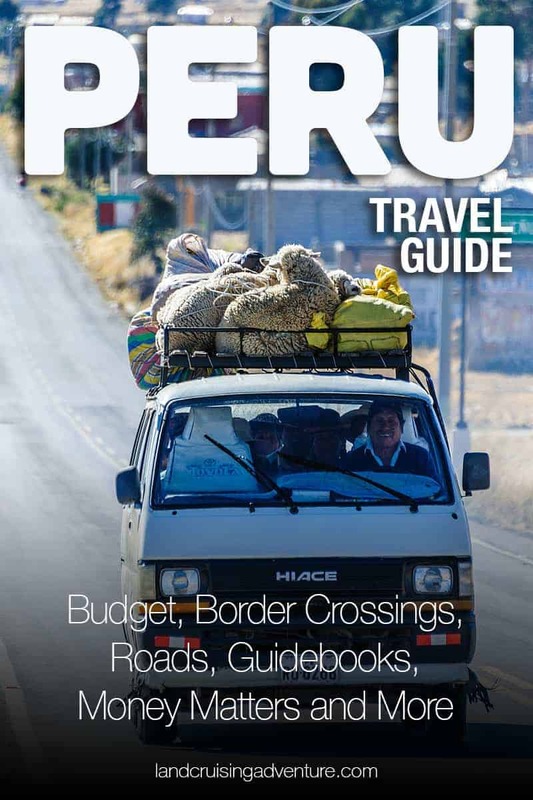 Other travelers, especially overlanders, are smitten with the South America Handbook as it is more focused on road travel. Various churches, historical burial sites and towns around Lake Titicaca (read more here). A highlight of Peru. Machu Picchu and the other sites in the Sacred Valley. You can read about it here. Paucartambo festival. It was among the best festivals – if not the best festival – we saw in South America. See the photos and story here. Manu National Park. We didn’t take a tour into the park, but loved the sunrise at Tres Cruces, at the edge of the park, and did drive all the way down for as long as there was a road. Paid no entrance fees, and loved the trip. Arequipa, where we found the Monasterio Santa Catalina enough reason to have stopped in this city. We wrote about it here. North Peru was surprisingly interesting and varied in this respect: We enjoyed Chavin (north of Huaraz), loved Huaca de la Luna and Chan Chan near Trujillo, and are happy to have visited Sipán as well. More on that topic in this blog post. 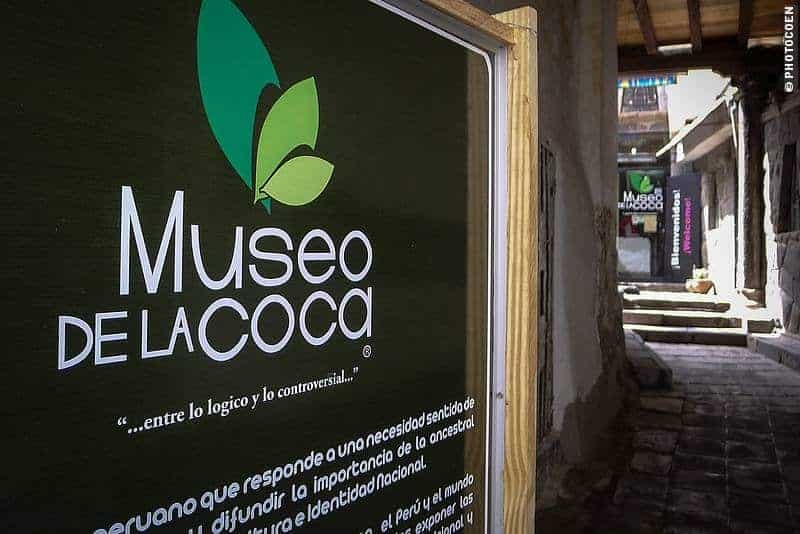 Small exhibition on coca in Cusco. You pay foreigner fees for most of these sites. Many of them are reasonable enough, like 10 soles for most of the ruins/museums in northern Peru. 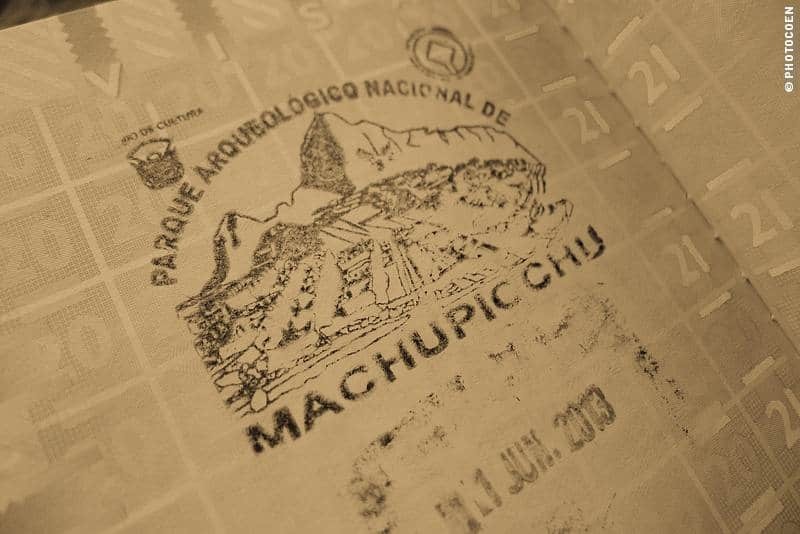 It’s especially Machu Picchu, including the Sacred Valley, which entrance fee is just ridiculous. 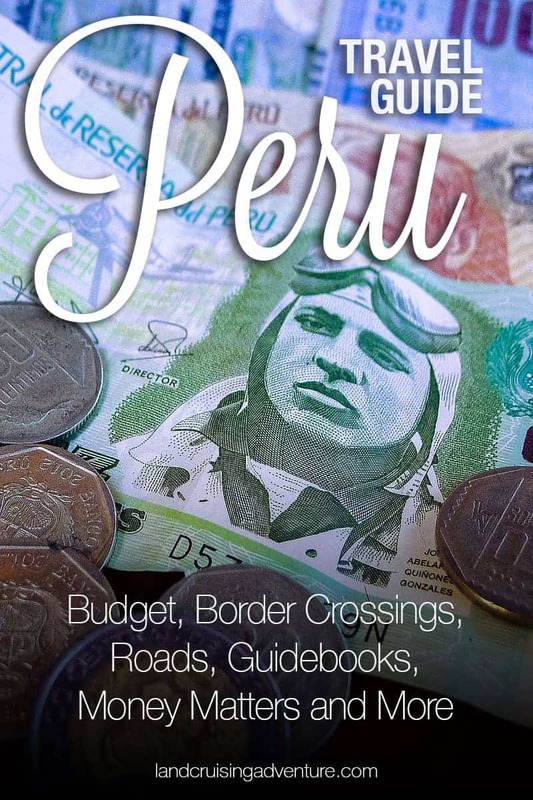 We hope you found this Peru Travel Guide useful. What are your experiences? Feel free to share them with us in the comments below. great stuff guys! Didnt see you mention Paracas? one of the best 4×4 parks in Peru!